Saturday, February 20th was a totally flyable day, and Terrance and I opened each of the hives for a late winter, early spring inspection at Smoke Farm. I knew from my mid-January feeding up there that one of the hives had died. Between two of the boxes, a few bees’ heads were popping through, their proboscis hanging out. When you see their tongues hanging out like that, it’s usually an indication of starvation, and it was horrifying to see them like that. I didn’t tell anyone for a few weeks what had happened. It hit me hard, but by this Saturday, I was through the grief and ready to see what had happened inside the hive. I was also extremely excited to see how the Carniolans were doing; they had so much honey going into the fall, I anticipated a bustling, beautiful hive. We began opening the hive I knew had died, the Italians on the left from the front of the bee-house. Usually in a starved hive, one will find the cluster of bees around the queen and many bees head first in empty cells of honey. It’s a very clear portrait of their last moment of life. As we opened the hive, we observed the top frames all half-filled with capped honey, about 40 lbs worth. So I thought, “Maybe they clustered away from their stores during a cold snap and couldn’t make it to the honey.” That will happen from time to time. The bees will cluster up to keep warm but be just a little too far away from the bulk of their stores to survive the cold snap. There were also queen-like cells on one of the frames with bees in them. Oddly, there were not many bees at all. We found one cluster of 20 bees, but there was no queen present in it. Many frames were completely absent of bees, and others had only 1-3 on them. The brood box below was empty. At the bottom of the box in the screened area there were about 250 dead bees. That might sound like a lot, but this hive had 20-30,000 bees going into the fall. I collected the dead and inspected them later. No queen was present and some of the bees were unusually small, like they had either been raised in a small cell or perhaps had gotten chilled toward the end of their development. There were no mites present on the bottom board or that I could find when I shook the bees out on white paper. Nothing really made any sense to me. The queenless cluster of the Italian hive. In hindsight, I now know that this colony was a little too small going into the winter because they need a mass of bees to maintain heat, but still, many thousands of bees disappeared between October and February. Did the living bees manage to drag them out when the weather got warm? They had eaten very little honey, so does that mean they perished in late autumn? 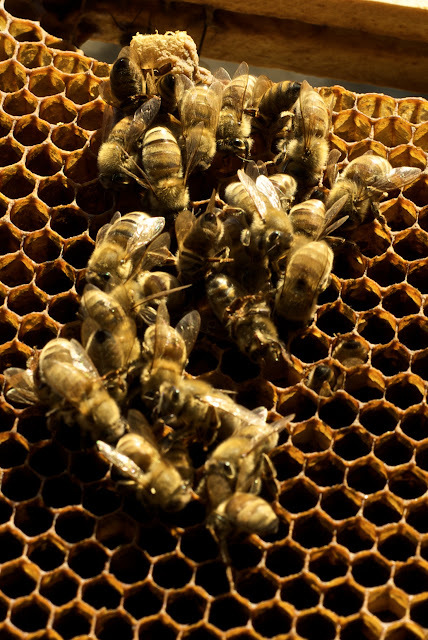 Did the queen die unexpectedly and the bees try to raise a new one? Did the colony leave as a new wave of brood was about to hatch? Were these smaller bees the result of chilled brood that managed to survive, or is there a disease at work? Was this a case of Colony Collapse Disorder that left young brood ready to emerge, only to find their sisters gone? There is just so much I don’t know. Flyable Days Ahead! Thursday, Sunny. Highs in the mid 50s. Northeast wind 10 to 15 mph. Let me introduce you to one of my favorite phrases of the beekeeping craft: ‘flyable days’. About that time in late winter when the sun pops out and the temperature warms up a little, inspiring you and me to maybe work around the yard or go for a walk in the park, on those days the bees also emerge. Sometimes it’s just warm enough to make a quick evacuation of their bowels, but sometimes a few daring foragers are going to go abroad to see what’s available. These days are so exciting to me. It means spring is coming and I”ll have the opportunity to ‘crack’ open a hive soon. Here in the Northwest, the maple buds are just beginning to turn red, a few cherry trees have bloomed, and I spotted some catkins on a birch tree this weekend, all very good signs for the bees and ourselves. At Matt and Monica’s house in the Central District, the Carniolans were out collecting pollen from somewhere, dull white balls pressed into their pollen baskets. That observation speaks volumes right there: the queen is laying eggs and the workers are retrieving pollen to feed the larvae. My bee-sense is telling me they are happy, and barring an unusually cold and wet pre-spring, they’ll get off to a good start this year. But the Italians were quiet. The Italians are beautiful bees, quite golden in color, and I swear they seem to glow with the sun coming through them. They are famous for being gentle and developing huge populations that produce copious quantities of honey. However, from what I have read, heard, and observed, the Italians prefer 55 degree temperatures before they venture out into the day. They also maintain a large-ish population through the winter, which means they require larger stores of honey to survive. The Carniolans, on the other hand, are purported to fly at around 50 degrees, and the queen will let the populations shrink through the fall and into the winter, ensuring less mouths to feed during the darker dearth. It must have been just right for the Carniolans, and not quite right enough for the Italians. Today was not quite a flyable day, but we had a long, suspended flyable moment, with the sun beaming for a while and then a cold front moving in. 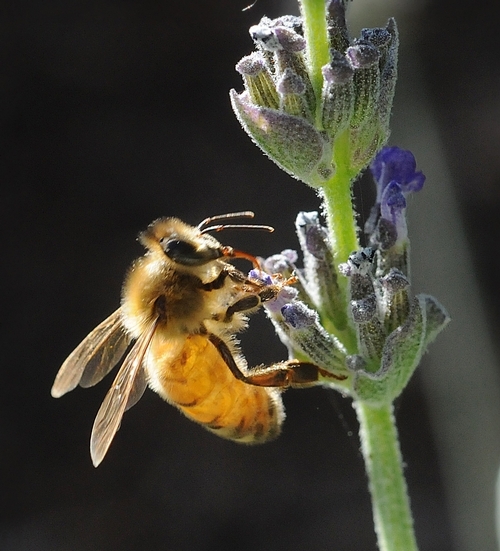 On my porch late this morning, I spied a honeybee in the crocuses, filling her pollen basket with bright orange pollen. Per my ritual, tomorrow morning I’ll be checking the Weather Underground for fairly accurate predictions of the day’s weather. Here’s wishing you many flyable moments tomorrow until we reach flyable days.